Not the best gaming chip for the money, but still our favourite all rounder. Remember when AMD launched its first quad-core processor in 2007? We can, because back then it seemed like AMD was months from keeling over stone dead. Today, the company is in much finer fettle. 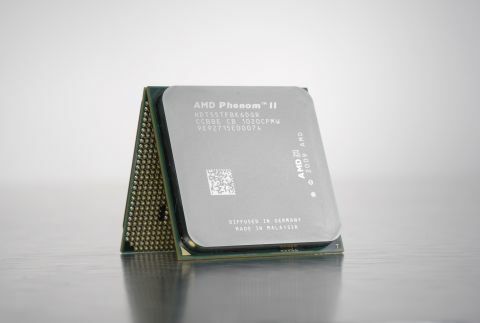 For proof, look no further than the new AMD Phenom II X6 1055T. Somehow, AMD has managed to produce a six-core PC processor and sell it for just over £10 more than its best quad-core chip, the Phenom II X4 965 Black Edition. It's actually cheaper than several Intel quads. Inspect the detail specifications and the Phenom II X6 1055T only gets more impressive. The transistor count has grown from 758 million transistors to 904 million. And yet the smaller quad-core 965 is rated at 140 Watts while this new six-core 1055T is a 125 Watt chip. Of course, at 2.8GHz, the 1055T is clocked quite a bit lower than the 3.4GHz 965 BE. But AMD has clearly done something right.